CENTER CITY (WPVI) -- Philadelphia Police Officer Mike Wilson is recovering from a bruised and swollen eye after authorities say he was attacked while breaking up a high school fight at 15th and Chestnut streets in Center City Tuesday afternoon. Police say Wilson was sucker-punched from behind. One person has been arrested in connection to the incident. Officials say Officer Wilson was treated at local hospital and is now recovering at home. "He's doing well. We've seen this phenomenon lately where the students want to come down to Center City to gather, but we've seen that in other parts of the city, as well," Philadelphia Police Inspector Altovise Love-Craighead said. 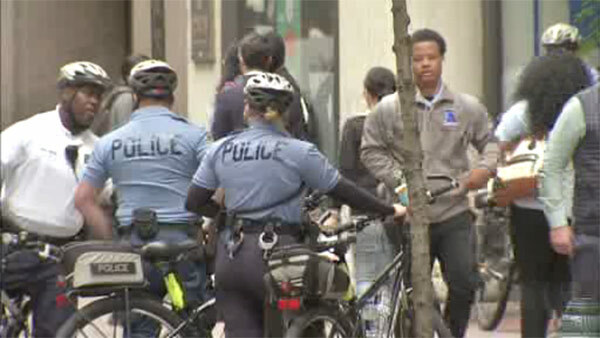 As school dismissed in Center City around 2 p.m. Wednesday, the Philadelphia Police Department's bike detail was out in force. These bike patrols around City Hall are nothing new, but the attack on Officer Wilson led the department to deploy a videographer Wednesday, and through the end of school, in hopes of curtailing any more problems or fights. Action News spoke with Martin Johnson who works in Center City. "It's scary. You never know what's going to happen. You don't know if you look at someone the wrong way, are they going to retaliate on you," Johnson said. The Center City bike detail deploys officers from all over the city, taking valuable resources from those area, but the move was in response to the flash mobs and other problems some students have been causing in recent years. "It's YouTube. Everyone wants to go viral. You got Facebook. It's all for the camera," Johnson said. Police say these students have free SEPTA transportation passes and a small few of them use them to come to Center City to cause problems. Police are now working to have those passes revoked if they get in trouble with officers. The name of the juvenile arrested has not been released.